the perambulation of Concord Performed by Thoreau in Sept., 1851. (the passage I’m interested in is in *WildFruits*, p.166, but the name appears many times in his texts). The first one is Herbert Gleason’s 1906 map. specialist, could you tell me where Beck Stow’s swamp is, exactly? Thank you writing concerning Beck Stow’s Swamp I have attempted to contact the author of the book, Bradley Dean, but learned from the Thoreau Institute he passed away several years ago. I am now trying to locate the author of the map, Theo Baumann. I will let you know when I have more information concerning the differences related to the location of Beck Stow’s Swamp on Gleason’s 1906 Map of Concord and Baumann’s map of Thoreau country. Thank you very much for your help and quick answer. Let me know if you learn something! I noticed that on Walling’s 1852 map of Concord (available here: http://maps.bpl.org/), a swampy area seems to be indicated where Gleason located Beck Stow’s swamp. Yes, that is possible. However, Thoreau’s map of the New Road toward Bedford on which he located Beck Stow’s swamp was created in 1853. 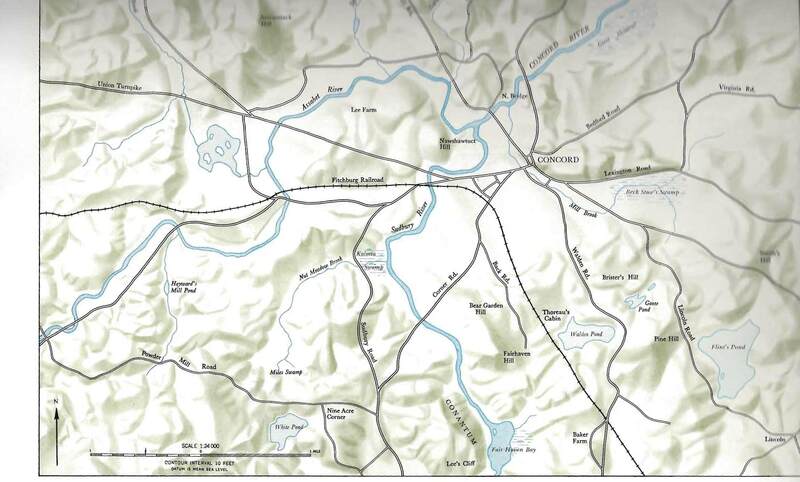 When Walling created his 1852 map of Concord he would not have had access to Thoreau’s 1853 map of his New Road toward Bedford on which he noted the location of Beck Stowe’s swamp by the intersection with what is today referred to as the Old Road to Bedford. August 23, I854. Vaccinium oxycoccus has a small, now purplish-dotted fruit, flat on the sphagnum, some turned partly scarlet, on terminal peduncles, with slender thread-like stems, and small leaves, strongly resolute on the edges–of which Emerson says, the “Common cranberry of the north of Europe,” cranberry of commerce there. October 17, 1859-These interesting little cranberries are quite scarce, the vine bearing (this year at least) only amid the higher and drier sphagnum mountains amid the lowest bushes about the edge of the open swamp, There the dark red berries (quite ripe, only a few spotted still) now rest on the shelves of the red sphagnum. There is only enough of these berries for sauce to a botanist’s Thanksgiving dinner. I have come out this afternoon a-cranberrying, chiefly to gather some of the small cranberry, Vaccinium oxycoccus. This was a small object, yet not to be postponed, on account of imminent frosts-that is, if I would know this year the flavor of the European cranberry as compared with our larger kind. I thought I should like to have a dish of this sauce on the table at Thanksgiving of my own gathering. I could hardly make up my mind to come this way, it seemed so poor an object to spend the afternoon on. I kept foreseeing a lame conclusion-how I should cross the Great Fields, look into Beck Stow’s Swamp, and then retrace my steps no richer than before. In fact, I expected little of this walk, yet it did pass through the side of my mind that somehow, on this very account (my small expectation), it would tum out well, as also the advantage of having some purpose, however small, to be accomplished-of letting your deliberate wisdom and foresight in the house to some extent direct and control your steps. If you would really take a position outside the street and daily life of men, you must have deliberately planned your course, you must have business which is not your neighbors’ business, which they cannot understand. For only absorbing employment prevails, succeeds, takes up space, occupies territory, determines the future of individuals and states, drives Kansas out of your head, and actually and permanently occupies the only desirable and free Kansas against all border ruffians. The attitude of resistance is one of weakness, inasmuch as it only faces an enemy; it has its back to all that is truly attractive. You shall have your affairs, I will have mine. You will spend this afternoon in setting up your neighbor’s stove, and be paid for it; I will spend it in gathering the few berries of the Vaccinium OXYCOCCUS which nature produces here, before it is too late, and be paid for it also, after another fashion. I have always reaped unexpected and incalculable advantages from carrying out at last, however tardily, any little enterprise which my genius suggested to me long ago as a thing to be done, some step to be taken, however slight out of the usual course. I have located Beck Stow’s Swamp on one of Thoreau’s Land Surveys on file at the Concord Free Public Library. and scrolling down the page. Thoreau’s notation is right below the road intersection. I found this reference in the Herbert Gleason Archives at the Concord Library. So I would accept Gleason’s map but I have not yet identified the source for Brad Dean’s map, but still looking. You could be correct, the area where Beck Stow’s Swamp was located in Thoreau’s day is high and dry today (I drove by there this morning), although there is another swamp just a little further south known as Gowlings which was and still is wet. Lexington Road and is bordered by the Mill Brook. Gleason’s map is slightly in error in this area, showing the Mill Brook crossing Hawthorne Lane a bit further south than it did and does today. My wife and I walk that area every day. Thank you for your letter that arrived as a complete surprise ! if my memory serves me right, i did that map 1967/68 in Christchurch, New Zealand. As this is a lifetime in my past, i cannot remember from whom and what basic information i had at hand when drawing that map. I am also not able to correct those omissions, as i have retired my pen and magnifying glass !! But what i find incredible to believe is HOW you could find my present address !? You see, i have moved COUNTRIES and homes at least 20 times and been living at the present address for only one year ! Are you working with the CIA ??? Ha Ha ! Some ten days later come the high blueberry, swamp blueberry, or bilberry. We have two common varieties: (Vaccinium corymbosum and its variety, atrocarpum). The latter, which is the least common, is small and black, without bloom, more acid, and a day or two earlier than the thimbleberry, beginning the first of July; and both last to September. I notice the green berries by the thirtieth of May, and between the first and fifth of July begin to see a few ripe ones. They are at their height from the first to the fifth of August. They are said to be found as far north as Newfoundland and Quebec. They grow in swamps, or if they are very wet, about their edges, and about the edges of ponds, and occasionally you meet a bush even on a hillside. It loves the water so much that though it may grow about the edge of a pond with steep and hard shores, like Walden and Goose Pond, it is confined strictly to the shoreline and will not bear well except in seasons when the water is high. By the sight of these bushes, as of button bushes and some others in a hollow, you may know when you have gotten down to the water-level. Let the ground in the woods sink to a certain depth so that water or considerable moisture is reached, and sphagnum and other water plants spring up there; and if man does not interfere, a dense hedge of high-blueberry bushes will commonly spring up around the edge, curving over it, or perhaps will extend through it, and this whether it is a mere hollow a rod across or a swamp of a hundred acres. This is the commonest stout shrub of our swamps, of which I have been compelled to cut down not a few when running lines on a survey or in low woods. When I see their dense curving tops ahead, I expect a wet foot. The flowers have an agreeable, sweet, and berry promising fragrance and a handful of them plucked and eaten have a sub-acid taste, agreeable to some palates. The fruit has a singularly cool and refreshing, slightly acid flavor; yet the botanist Pursh says of his (Vaccinium corymbosum, which must be another kind) simply, “berries, black, insipid.” In the Duc d’ Aremberg’s garden at Enghien, it is said to be “cultivated in the peat border for its fruit, which is used like that of the cranberry” so slow are they to find out what it is goof for! Rarely I find some which have a peculiar and decided bitter taste, which makes them almost inedible. They are of various sizes, colors, and flavors, but I prefer the large and more acid blue ones with bloom. These embody for me the essence and flavor of the swamp. When they are thick and large, bending he bushes with their weight, few fruits are so handsome a sight. Some growing sparingly on recent shoots are half an inch or more in diameter, or nearly as big as cranberries. I should not dare to say how many quarts I once picked from a single bush which I actually climbed. These are not all that temp most into the swamps. Annually we go on a pilgrimage to these sacred places, in spite of dogwood and bilberry bumps. There are Beck Stow’s and Gowing’s and the Damon Meadows and Charles Mile’s and others, which all have heard of, and there are many a preserve concealed in the midst of the woods known only to a few. I enjoyed reading your exchange on the location of Beck Stow’s swamp. Sorry I could not attend your talk to discuss your findings.. my talk was scheduled at exactly the same time! I have been extracting all place names from Thoreau’s journal (as I think you know) and now have reached over 2,000 place names. In the Intriguing ‘Case of Beck Stow’s Swamp’ — this location is visited and named over 40 times during Thoreau’s ambles around Concord, as set down in his journal. (It occurs as “Beck Stow’s” or as “Beck Stow’s swamp” with some spelling variations.) So, I will give these journal entries a review this week to determine the consistency of Gleason’s location (and your confirmed location from T.’s survey) vs. the implied location from each itinerary for those 40 Thoreau walks (in my database of place names). My conclusion is that Thoreau was using the meaning of creek from Cape Cod– i.e., a saltwater inlet– to describe a Walden ice-and-water embayment’s shape, and not intending the meaning to be a small flowing stream, which is a brook. I firmly believe he would have used brook if he meant it was a brook. Let me know what you think. And let’s try to rendezvous next year at AG ’16! Thank you for your comment, I had not realized that Beck Stow’s Swamp had so many entries in Thoreau’s writings. What was Thoreau doing in Beck Stow’s Swamp other than gathering cranberries and blueberries? I would have attended your presentation had it not been scheduled at the same time as mine but in a different building. although the flowing water at that point has and is better known as “Cargill’s Ditch”, one of the many drainage ditches in Concord over near the Police station. I enjoyed seeing the photo of you and your wife at Walden Pond, good temperature for a dip. I agree we should definitely plan to get together next year for the 2016 Annual Gathering.